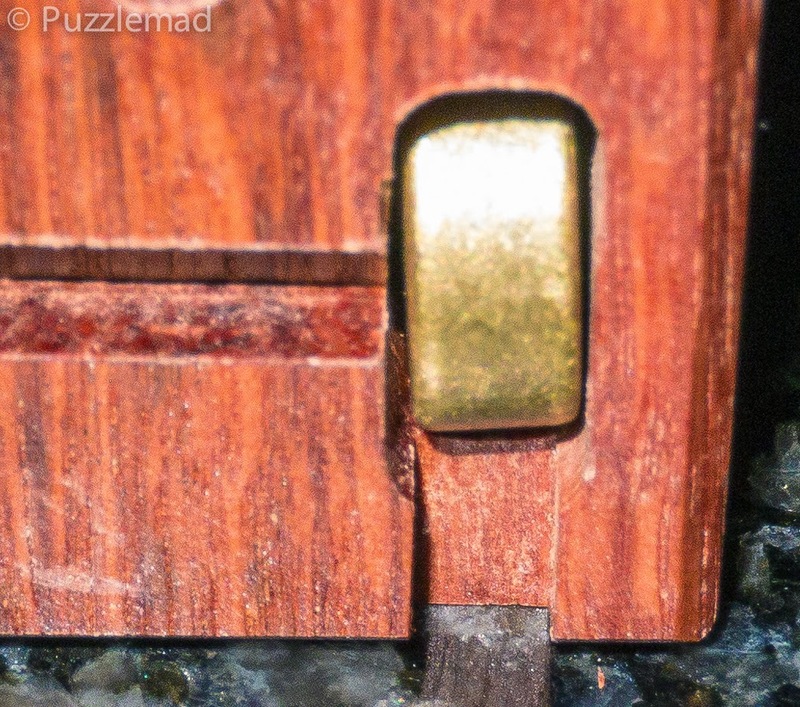 PuzzleMad: The most amazing exchange puzzle in the world? Probably! The most amazing exchange puzzle in the world? Probably! I don't want my article to sound like a Carlsberg advertisement but I really do have to gush about this puzzle. 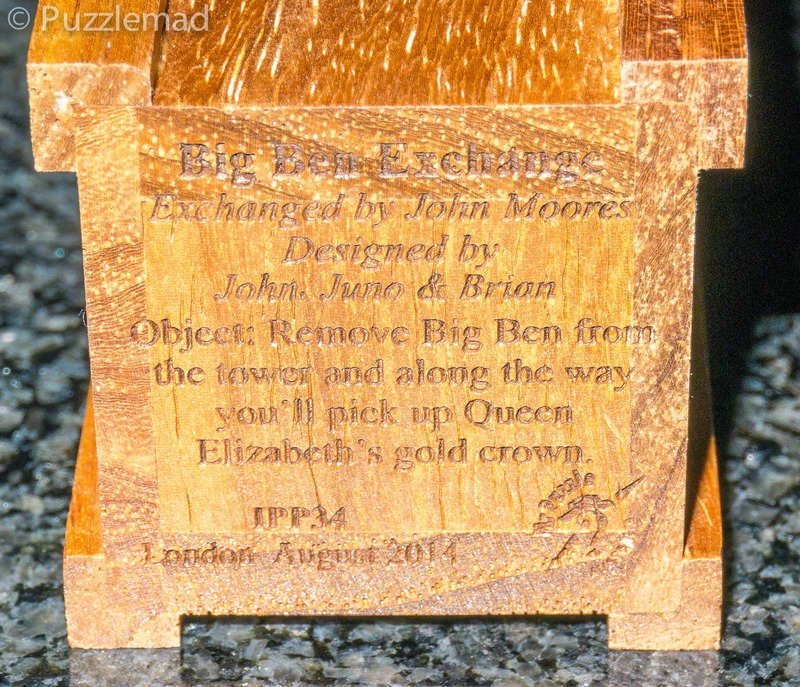 It's the Big Ben puzzle exchanged by John Moores, made by Brian Young (MrPuzzle) and designed by collaboration between the two of them with Junichi Yananose. I am originally a Londoner (although I moved aged 18 to Edinburgh to go to Med school and stayed there for another 18 years before heading 'daann saaff' (that's down south to you non-Londoners) to the steel city, Sheffield (that's 'oop north' to you Londoners) to continue my career. But, despite all that moving about and even changing my accent (you don't last long in Edinburgh with a Cockney accent), I remain a proud Londoner and so I was absolutely chuffed to bits that my first IPP could be in my home town and of course the puzzle that has one of the most recognisable features of London was one I could not miss. I first saw this puzzle at the last Midlands Puzzle Party the week before IPP. I sidled over to Brian's table to have a quick look at his warez (illicit stash??) but had no intention of buying anything as I had to save my cash for the following week. The Big Ben immediately caught my eye because of the incredible detail work that had been done. Whilst Brian was chatting to someone else I had a quick glance at his price list and recoiled in horror at the price of this prize puzzle! I wandered away and played with other toys. Later during the day, whilst chatting with the lads, the topic of Big Ben was coming up again and again as others chose to put their money where their mouths were. At this point I discovered that no-one could actually take it away on the day. The rules for the puzzle exchange are that the puzzles must be new and have NEVER been released before. Hence Brian could take orders but not give any out until after the exchange had taken place. I then realised what a truly amazing thing John Moores had done! He had commissioned the design and manufacture of a stupendous puzzle and then was going to give away 100 of them to his fellow exchangers. The generosity of the gentleman just bowls me over every time I think about it - I know John will not have paid the price I did because he bought in bulk but even if he paid 50% of what I did then that is one of the most generous gestures I have personally seen amongst puzzlers ever (who tend to be the kindest people I know). I only managed to meet John and his lovely partner once at IPP when I was helping Goetz at the puzzle exchange and I never really got to talk to them so let me say to them both now: Thank you so much for bringing this puzzle into existence! Toward the end of the MPP I again faced up to Brian and asked him to "sell it to me" - I wanted to be convinced to put a significant part of my IPP funds down before I even got there! Brian said simply that it's a multi part sequential discovery puzzle with pieces to find, tools to use and mazes to navigate and then dropped the bombshell that he thought it was as good as the Opening Bat which I had rated as my favourite puzzle of my first 2 years of blogging. I was lost! My signature went down and I had a little secret which I could not tell Mrs S!! That MrPuzzle will end up taking most of my bank balance - but having met his fantastic wife, I sort of forgive him! I picked up my copy the day after the exchange (in fact I picked up two - Shane had bought one at the MPP and it was my job to fetch it for him and post it - VERY well packed up) and managed to take my photos and then just savour the look of it for a while. I am trying very hard not to zoom through all the puzzles I picked up in one go! It's very tough but I am sort of pacing myself - needless to say, I only managed to resist the lure of this particular puzzle for a few days and I was off! From here on there might be a couple of very tiny spoilers but not enough to ruin your enjoyment of this puzzle if you manage to obtain it. 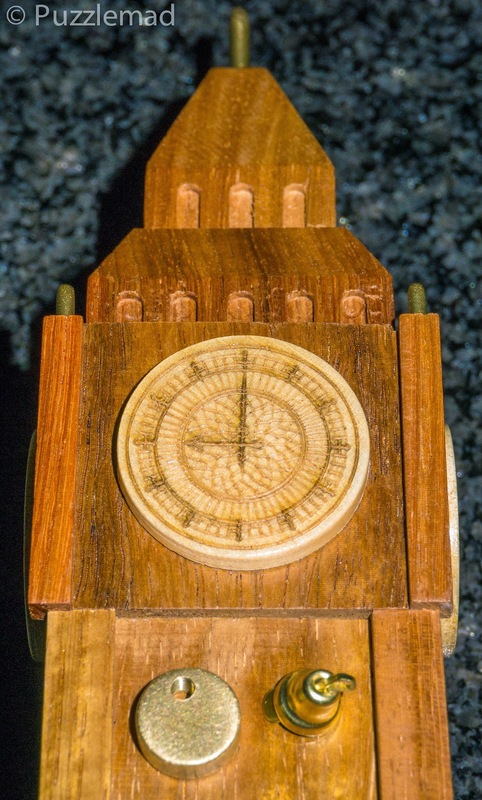 Whilst watch TV one evening, with a cat purring and kneading on my lap, I picked up Big Ben and looked for my first clue - the aim of the entire puzzle is to dismantle the Elizabeth Tower and find inside the Big Ben bell and in the process also find Queen Elizabeth's misplaced crown. There's actually not a lot to play with at first - a few bits have a small amount of movement in them but don't go far and the clock faces wiggle about. I very quickly dropped a clock face on the sleeping cat who didn't move at all! I could see inside a bit but nothing else would happen and the opposite face was stuck! Infuriating and I loved it! 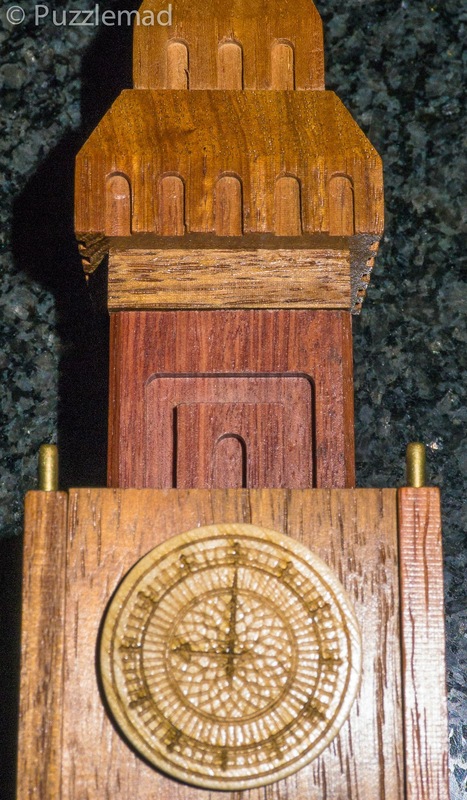 After a bit of thought I realised that there could only be one or two mechanisms holding the other clockface in place and after I ruled out one, the other also failed and then mysteriously worked for me providing me with more tools for later use. Looking closely I could see another ingenious trick that had been used to ensure the required movement required something extra to make it work! Lovely! It's a-maze-ing - this is not much of a clue! After that we discover a maze - or even 2 mazes! It's a requirement to navigate both at the same time without properly understanding how they work and with most of the maze being hidden! This time Shane and I were not doing A tandem solve because he was on holiday (but had taken it with him). As soon as I saw the maze I was worried for him as he really struggled with his Revomaze and needed a lot of help from me to open it. I needn't have worried - the maze is very different to a Revomaze - it needs more thought, planning and understanding than dexterity. Solving the maze section took me quite a while over two or three days! At the bottom of the tower, I found the lost crown - she must have a rather large head because the crown was quite big. At this point I was left with quite a few pieces and a fairly obvious movement to make but no real idea how to do it. I initially managed to do the necessary moves using my fingers and a single tool but the method was so inelegant that I just knew that this was not the method that John, Brian and Juno had intended. I had all these tools and had not used them! In fact I was not the only one to suffer from this - a few days after I had solved it, Goetz contacted me to ask what my method had been. He also had solved it using an inelegant method and instinctively knew it couldn't be correct - he had not received the solution with his exchange version - so I emailed him a crucial picture from it. No! I had not cheated! I had spent a couple of hours looking at all the tools that I had accumulated and made a discovery about one of them that was absolutely crucial. This combined with a very close look at the construction of the inner tower gave me all I needed and I made a sort of mega-tool which worked beautifully to get me one step forward and then the top of the tower started to slide. But it only slid so far! Hmmmm! Even after all that it wasn't going to reveal it's innards that easily - a little more thought and manipulation was required and Big Ben was dumped unceremoniously on the cat on my lap! I cannot sit down for more than a few minutes without being joined by a furry puzzler! You didn't think I would show all the tools did you? I had solved it! But reassembly was going to challenge me almost as much - the aim is to put it all back together and return it to it's initial state, which meant that all the clock faces needed to be at 9 O'clock. I really struggled to reassemble the puzzle and when I had done so one of the clocks was showing an odd time. No manipulation that I tried could rectify this and I left it a day or so. Goetz again came to the rescue and made a useful suggestion and on Friday night I finally got it properly reassembled. This is probably one of the most awesome exchange puzzles ever given and those who participated in the exchange have really gotten themselves something truly special! Brian does plan on making some more of them available when he gets home from his extended holiday - so contact Sue and order one. Don't hesitate at the price - you get a lot of puzzling for your money! Thank you to John, Brian and Juno for a truly great experience worthy of my first IPP and to commemorate my home town! Finally a very quick and very BIG thank you to Brett Kuehner. I mentioned in my IPP blog post that he had given me a gift of a bottle of wine caught up in a bottle disentanglement as a gift for my work on my blog and presumably keeping him entertained when he is really really bored (I just cannot understand why anyone would read my drivel!) I finally managed to disentangle the bottle and on taking it out was absolutely delighted to see that it was not wine but a half bottle of pure nectar! It is Black Blood of the Earth - a fabulous cold brewed and vacuum extracted coffee! I recall having a discussion with Brett about it on Facebook and then forgot about it entirely. I am totally addicted to really nice coffee and had wanted to try this for a long time (ever since I heard about it from Leo Laporte) but the huge cost of importing it had put me off. I can report that it is absolutely delicious and is responsible for a couple of episodes of palpitations - Lord it's strong stuff! Thanks so much Brett! I agree, it's an amazing puzzle! I have not yet managed to get the bell out. My copy broke in transit back to the US. The corner pieces are easily broken off if it is not packaged well enough. Fortunately, I was able to glue the corner back on fairly easily. But I would exercise extra caution when shipping this puzzle. That's terrible George! Luckily they're not critical for the solution. The one I sent to Shane came bubble wrapped in a box which I then put in a bigger box with loads of packing peanuts. NOTHING was going to damage that sucker! Yeah, mine was in bubble wrap but then it was moving around loose in my suitcase. Should have taken it in my carry-on! Like you I hesitate while I knew the price at the MPP. It's only the second day I came to UK and I already flew out a lot money? So I waited and see if I can buy it on IPP. A big wrong move I think, which let me regret so much. But anyway I had already told Sue that I want one and she put my name on her note. So I think I'll still have it, just later. Thanks for writing up such a nice post Kevin! Enjoy it when it arrives! It is brilliant. I suspect that importing the coffee to china will cost a fortune! It's rather remarkable that the laser engraving on the bottom was done after the whole thing was glued together. You know, I never even thought about that! Looking at the photo, I see you are right. I guess when using a laser, accuracy is always going to be perfect! Well ... it's always possible to misalign the text so it goes off the edges. Usually, it's easier to engrave a flat piece of wood that is then glued into the puzzle. That way if you make a mistake you just redo the small piece of wood. IPP34 - a meeting of friends OR "it's HOW big?" It's good to be amongst friends!